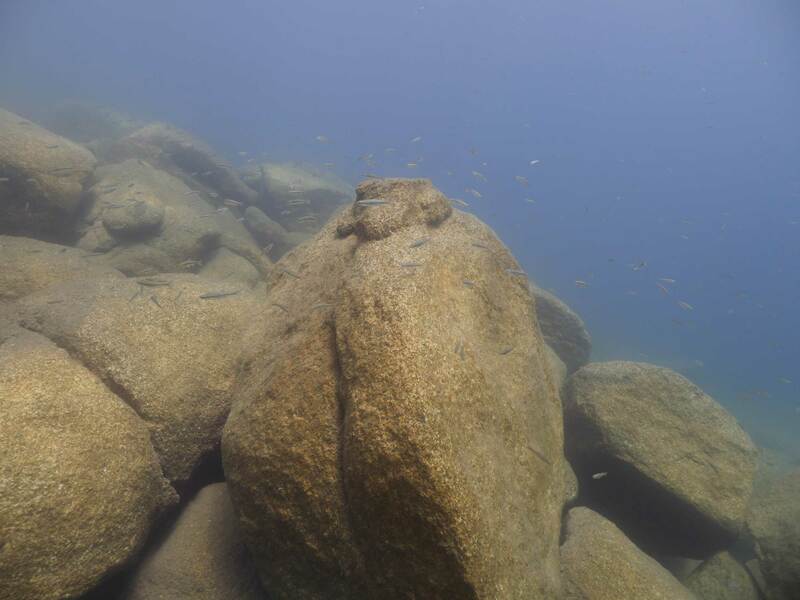 Project Baseline Lake Tahoe (PBLT) – Completes full coverage of the lake with its 6th Water Clarity Monitoring Station. 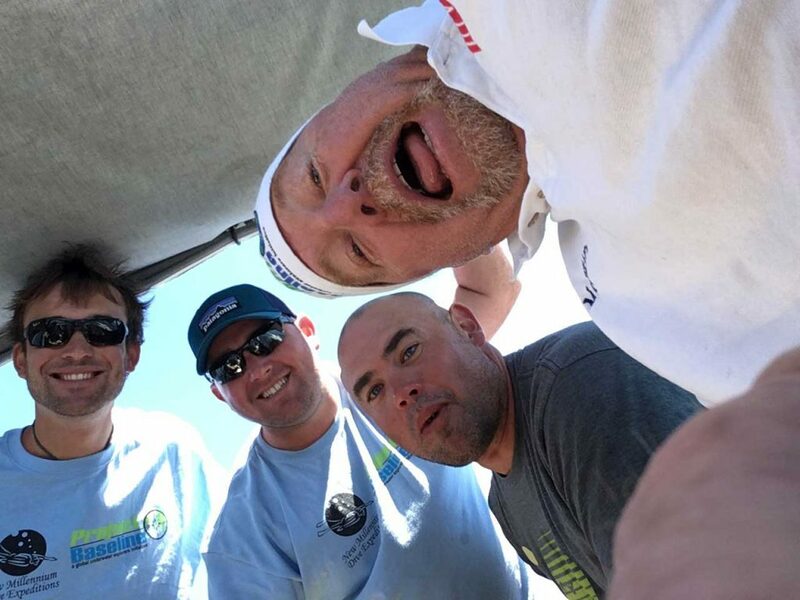 It was a great weekend for PBLT but before the story ensues, we must thank several members of New Millennium Dive Expeditions (NMDE) for their dedication, effort and support. First, founding member and Boat Operations Supervisor, Marc Briseno for being at the helm of our dive boat and tirelessly dealing with “rental” boaters and ignorant watercraft operators; this time of year, Tahoe is like a major freeway and 95% of the boaters have not got a clue what a dive flag means! Second, Peter and Trevor Fulks of Partial Pressure Productions. The NMDE Media Team. They are from the Bakersfield area of California and have a 7-hour commute to participate and their contribution to this weekend’s massive success was invaluable! Finally, Ben Brodie. His second operation with NMDE and his first opportunity to dive in Lake Tahoe. Ben was Project Baseline Fiji 2017’s Divemaster and Boat Wrangler as he was staff on the AdVantage Super Yacht. Ben is visiting Northern Nevada and volunteered to help with any needs that NMDE would have. It was great to have his expertise and to get him underwater! Thanks Ben, Trevor, Pete and Marc! Now on to the story. The weekend started with tank filling about 8:30pm on Friday the 11th and ended for the team around 11pm on Sunday the 13th; for after returning from the lake at about 4pm on Sunday, Peter and Trevor had a 7-hour drive home. Saturday the 12th, was day one and it was early to rise. On the road at 5:45am heading to launch the boat at the Cave Rock Boat Launch on the eastern shore of Tahoe. The first dive of the day would be in Glenbrook Bay where Peter and Trevor would conduct an SS Tahoe set-up dive. 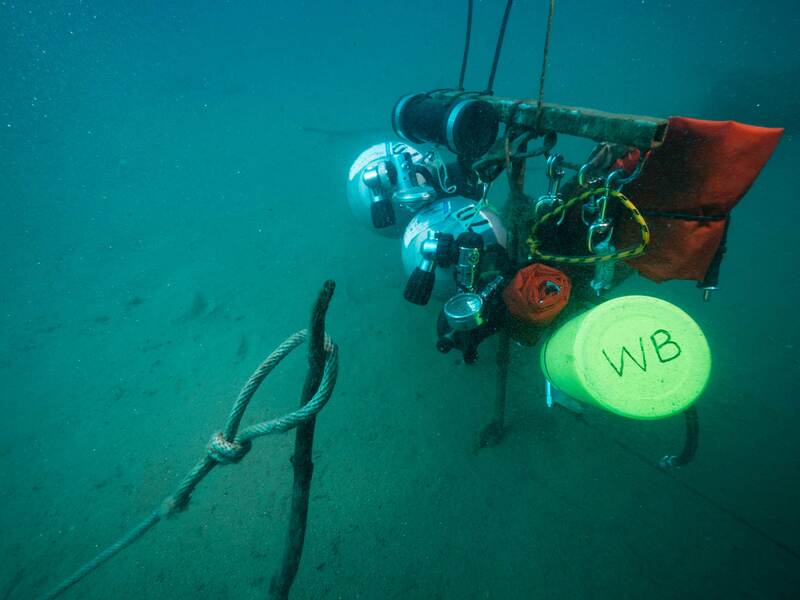 Working between our 70’/21m station and our 120’/36m station, they had several tasks that would allow our SS Tahoe Photogrammetry divers to conduct another pre-project dive and do some vital recon on the ship during the forthcoming dive on 19 August. With this complete, Peter and Trevor exited and the team headed south. 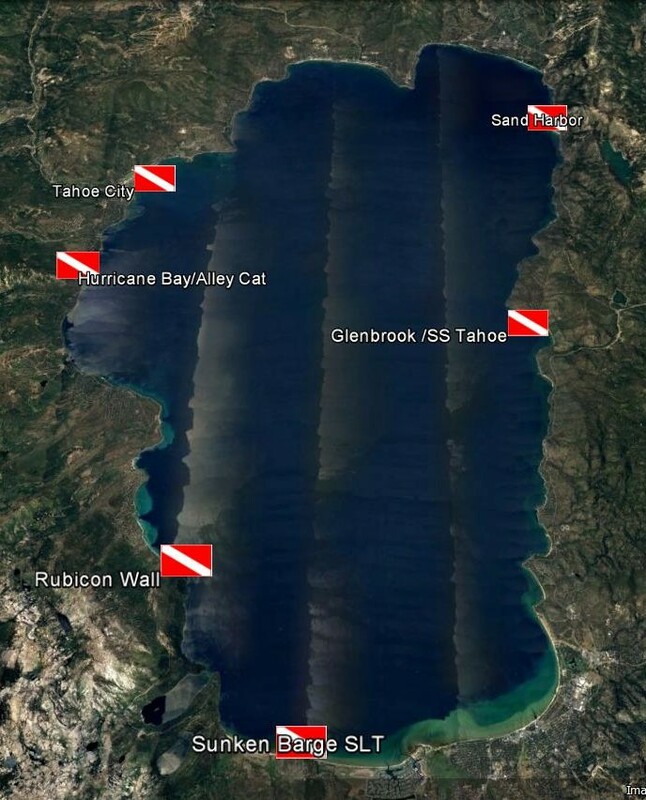 Our Project Baseline Lake Tahoe mission dive for this day was to establish our 6th and final Water Clarity Monitoring Station at the sunken barge in South Lake Tahoe; Click HERE to see an image of all the stations located in Lake Tahoe. This barge was introduced to us during our circumnavigation project back in 2014. In 2014 the barge was at a depth of about 7’/2m and following the extreme winter of 2017, it was at a whopping 14’/4m; however, depth is not an issue, but locating a monitoring site that 1) is established in an area where visibility might be most impacted by man and 2) where divers can easily take a “reproducible“ image were critical in the establishment of these sites. The South Lake Tahoe barge fit these parameters perfectly. Participating on this dive were NMDE Members, Peter, Trevor and Martin. The sensor was provided by funding from Global Underwater Explorers (GUE) in an Honorarium for the work that NMDE diver Martin McClellan conducted for a global research mission GUE’s Project Baseline conducted earlier in the year in the Fijian Islands. The 6th Station [38°56’28.97″N – 120° 2’46.45″W]: Note the the green lake hue – This photo was not edited. If you look closely just to the right of the barge, you can see our “2” (20’/6m) visibility marker and in the background, just barely visible is our “3” (30’/9m) marker but you can not make out the “3” so here the visibility is about 25’/7.5m. Next up was to introduce Peter and Trevor to the Camp Richardson Chara beds, a project that NMDE conducted in association with the University of Nevada in Reno in 2013. The Chara Bed is approximately 0.75 miles by 0.75 miles and is located about half-mile off shore on the south shore of the lake directly north of the Camp Richardson area. No mission was planned here just a familiarization dive but due to the extreme boat traffic and un-educated boaters, they were only able to visit the very southern extent of the bed. Chara is one of the natural plant species that grows in Lake Tahoe and is home to 11 endemic species; most of which are extinct. We wonder why? Could it be a human impact? Day 2 (Sunday) began early and from the Coast Guard launch in Tahoe City; by 7:30am we were out on the lake. The days missions were to visit the Hurricane Bay and Tahoe City Water Clarity Monitoring Stations, remove the sensors that were placed in 2015 (Funded by the Tahoe Truckee Community Foundation), download the data and then replace the sensors back onto the stations, introduce visiting diver, Ben Brodie from New Zealand, to Tahoe and Altitude diving, visually and without a scientific standard, visit the CalNeva Point wall to observe the growth of algae but primarily for the dive team to enjoy a fun dive; after all, we do a lot of work for the environment in Lake Tahoe and to conduct a fun dive along the way is a fundamental purpose of what Project Baseline is all about. At the Hurricane Bay station, divers Ben and Trevor conducted 3 dives and the data sensor was successfully recovered, downloaded and replaced. 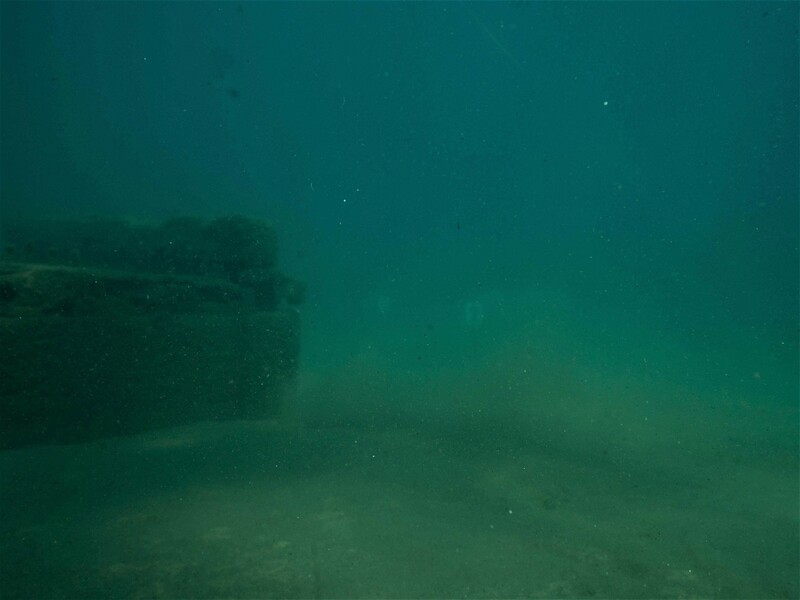 The visibility was very poor at about 20’/6m and the Lakes blue hues have become more green; typical for what we are encountering around the lake. 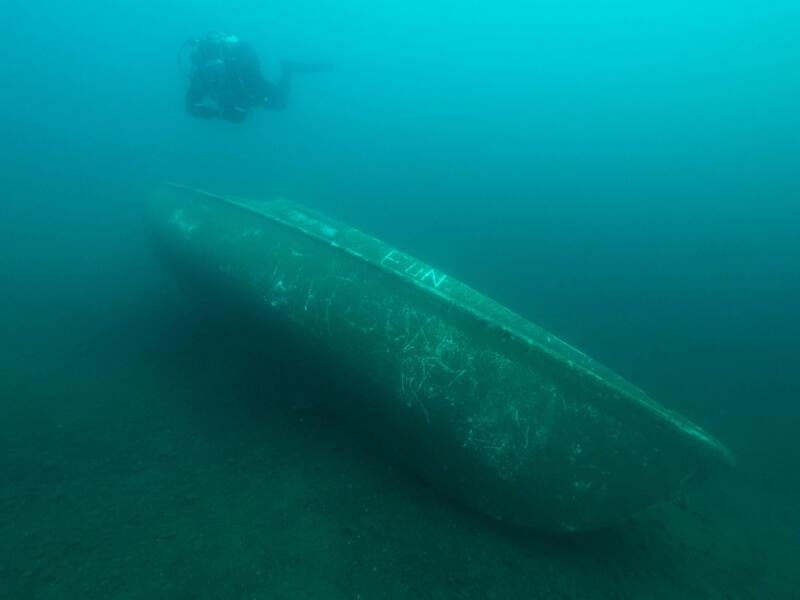 Diver Ben Brodie hovering above the Alley Cat, a sunken 24′ sailboat utilized as our PBLT Water Clarity Monitoring Station. Note the lake blueness is better than the barge photo above but still more green than in past years. The Tahoe City station was a bit of an unknown. Set-up in September of 2015, we placed this station about 1 mile from the mouth of the Truckee River. Albeit we had great GPS data when established, you never know if you are 50 feet, 100 feet or exactly spot on the station when returning to the GPS coordinates and with the lake visibility so poor, we gave it our best. Well our best, (awesome job “team” Trevor and Ben) was good enough as they dropped down our anchor line and found the station within minutes about 50 feet from the anchor. They brought the sensor up, waited upon the surface while the data was downloaded and then replaced the sensor. A quick note on the sensors. They ping a depth and temperature reading every 18 hours and this gives us very scientific and consistent data that our scientific partners can utilize in evaluating the condition of the lakes clarity in the Nearshore zone. The Tahoe City station, established on Sept 25, 2015 shows (black graphical line) that from that point, up to July 6, 2017 the lake rose over 7 feet; the majority of that water increase was from October 2016 to the July reading. Putting that into a usable number? That is 280 billion gallons of water; enough water to supply 1.4 million households annually; enough water to supply Los Angeles for a year! This graph represents 23 months of lake depth (black graph) and temperature (blue graph) readings. Note: August 2017 surface temps are almost 70f/20c a degree or two above the previous years high. With our PBLT work completed, we were on our way to CalNeva Point and divers Ben, Martin and Trevor enjoyed a great dive to about 60’/18m for a bit over an hour. 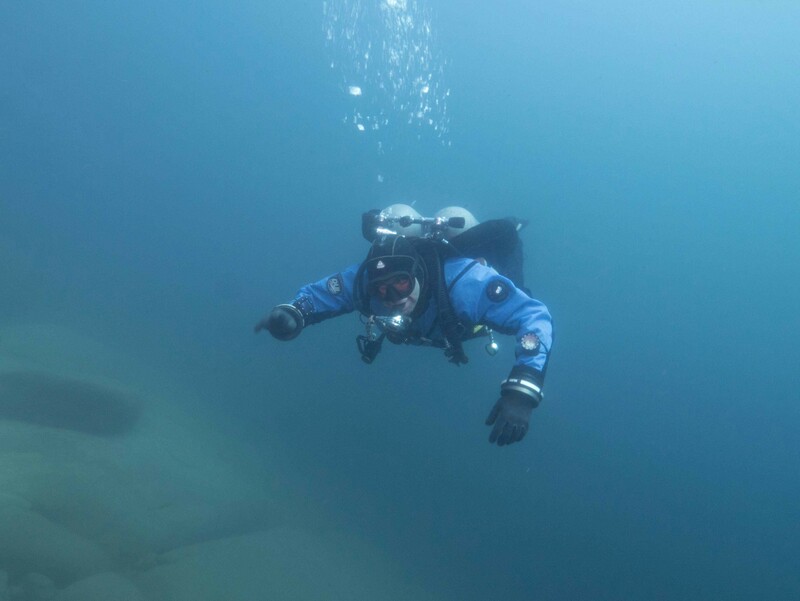 We must make a special note of thanks to Peter for giving up his diving on Sunday so that Ben, our visitor from New Zealand, could use his Drysuit and equipment to participate in the days mission. Again, thanks for following our progress and efforts in Lake Tahoe and stay tuned for our forthcoming post on the planned 12 expedition dive to the SS Tahoe coming on 19 August. Note the blueness up north is much more predominant than the images of the south and central lake regions. Lahontan Speckled Dace – small fish – at 15’/5m surrounding boulders prevalent on the eastern slope of the CalNeva point. 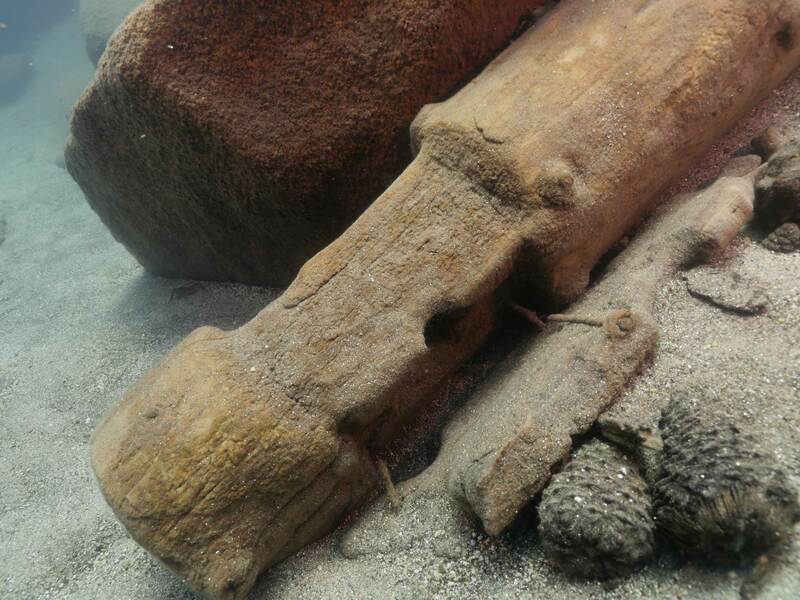 Old discarded log cabin logs from the cabins around the lake in the late 1800’s. When they rebuilt, they simply tossed the old back into the lake. All organic save the steel nails. It is sad to see how much lake contamination from human waste continues today! More evidence of “human” impacts upon the lake. 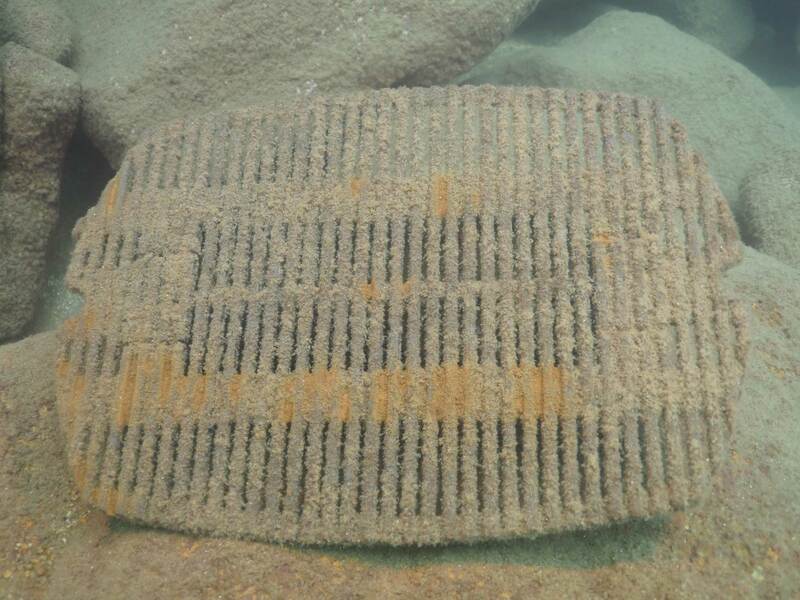 A discarded BBQ grille.